Origin and Habitat: Euphorbia ankarensis is confined to Ankarana and Analamerana, Madagascar where thousands occur. Extent of occurrence about 299.652 km² and area of occupancy 97.730 km². Recorded from 3 localities and comprises of one to three highly fragmented subpopulations. Habitat and Ecology: Tsingy (limestone outcrops) in the mountain range 'Falaise de l'Ankarana'. This is one of the most interesting landscapes in the north-west of the Madagascar. Scattered in the deciduous forests of these mountains are striking eroded limestone rock formations, the so-called 'tsingis', which are very difficult to traverse. Crevices in these rocks, filled with black humus, are the habitat of Euphorbia ankarensis which owes its name to the mountains on which it is found. This rocky habitats harbour a rich succulent flora comprising: Euphorbia pachypodioides, Euphorbia neohumbertii and its variety aureo-viridiflora, Euphorbia viguieri, Pachypodium decaryi, Pachypodium baronii, Pachypodium decaryi, just to cite a few of the more common. Like all the other north Madagascan Euphorbia species, E. ankarensis undergoes a seasonal change between a fertile (leafless) and a vegetative (leafy) phase. Euphorbia ankarensis is threatened by habitat degradation, fire, and by collection for horticultural trade. 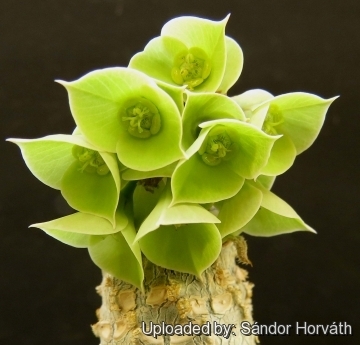 Description: Euphorbia ankarensis, as is implied by the specific name, is a rare and localised species confined to the 'Falaise d'Ankarana' in NW Madagascar. It has short fleshy sticks with attractive pale green cones of cyathophylls at the top, followed by deciduous leaves which are shed at the beginning of the dry season. It is on of nicest Madagascan euphorbia, found in many succulent collections. It was first collected in 1938 by Prof. H. Humbert. Stems: Fleshy, normally unbranched or (rarely) sparsely branched, that can grow to 20-70(-100) cm in height and 3-4 cm in diameter, with a crown of deciduous hairy leaves at the top, glabrous with a corky surface, splitting grey, or with some tubercles, these irregularly scattered or arranged in comb-like, somewhat spiral, longitudinal groups and closely covered with about 8 vertical series of large leaf scars. Leaves: Appearing between the flowers, in terminal rosettes. At the end of the flowering period, when the rainy season begins, a new rosette of leaves starts to form. The leaves are oval-acute or slightly acuminate, cordate at the base, 5-8 cm long, 2.5-4 cm broad, deciduous, thick, soft, dull green when young, young leaves especially with soft hairs on the lower surface, hairs silvery stiff, 2-3 mm long. Petioles sparsely hairy 5-10 mm long. Stipules expanded into vertical rows of small densely branched bristles. Spines: Tiny thorns appear only on the tip of the shoots and later disappear. Inflorescences: Short-stalked cymes, usually 2-forked, subsessile, borne near the end of the bare stem between the tubercles in early spring, followed by the leaves. Each with two to eight hanging cyathia surrounded by petal-like bracts (cyathophylls) white or pink with pink tips and forming a flower 'head' with a diameter of 50 to 80 mm in diameter. Flowers (cyathia): Numerous, c. 5 mm in diameter, pendulous and appear between their two acute cyathophylls. The cyathophylls are up to 15 mm long and 16 mm wide, skin-like mostly of a pale flesh-colour, but also yellow-green to purplish-red. Nectar-gland elliptic, yellowish. Ovary subsessile. Blooming season: The inflorescences then begin to develop at the end of the dry season, in October-November the plant is in full flower. 6) Haevermans, T. 2004. 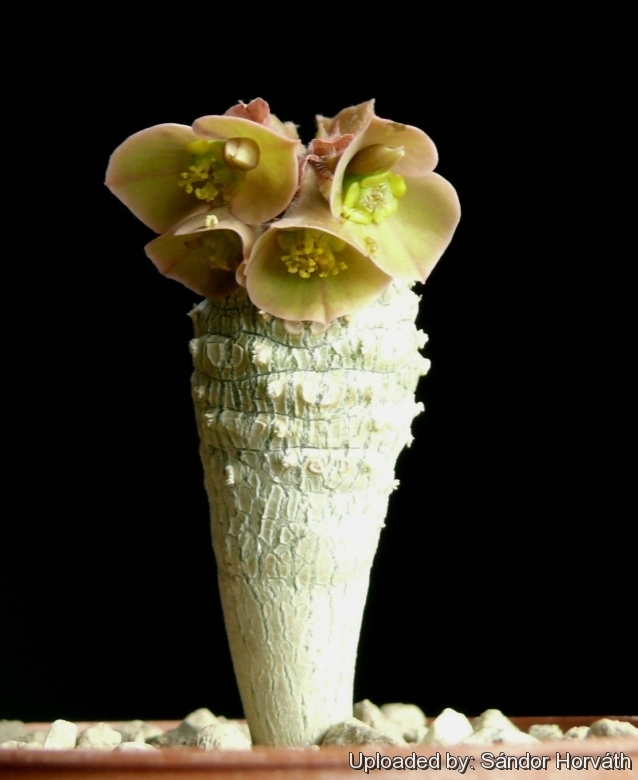 Euphorbia ankarensis. The IUCN Red List of Threatened Species 2004: e.T44286A10872590. http://dx.doi.org/10.2305/IUCN.UK.2004.RLTS.T44286A10872590.en. Downloaded on 13 January 2016. Cultivation and Propagation: Euphorbia ankarensis is an attractive, but slow growing species available from several sources for enthusiasts. It has the fame to be quite tricky to cultivate. Like all the other species from Madagascar, this plant needs a temperature of at least 10°C (50°F) in winter and will do better if kept even warmer. An occasional light watering in winter will prevent excess dehydration. Very similar, but easier to grow is Euphorbia millotii, which is freely branching and can be propagated by rooting cuttings of the branches. Propagation: It is propagated from seed sown during spring or summer or by grafting stem.. Germination occurs within 3 weeks. Sowing seed of this self fertile species is the surest method of growing typical offspring and seedlings are in the first season relatively easy to grow. It can be grafted as well.